The concept of a lake's health is somewhat easy to relate to humans, because they have an idea of what is healthy and well-functioning for humans and what is not. Nevertheless, defining a lake's health in the scientific world is not as clear, and is a subject of debate. One suggested concept of lake health includes a range of biological, physical, and aesthetic parameters as well as management, policy, and "value" considerations. To achieve such a complex conception of a lake's health, a multidisciplinary approach is required. Moreover, a combination of methods is needed because a single indicator of lake health is inadequate. Some of these methods measure ecosystem functions (e.g., primary productivity and nutrient cycling); ecosystem structure (e.g., diversity and abundance); internal processes (e.g., water circulation, residence time, temperature, and light); and external inputs (e.g., nutrients, sediment and chemical loads, and rain events). These data, coupled with society's values, are then compared to pre-established management goals, or are used to derive new goals. A lake ecosystem comprises communities of organisms that interact with each other and with the environment that sustains them. These interactions may, in turn, produce changes in the same communities and environment. In a healthy lake, the interactions are necessary to assure the lake ecosystem's sustainability. In an unhealthy ecosystem, the sustainability of the lake's communities is compromised, and in need of human actions to recover it and protect it for future generations. The balanced coupling of two functions—production and decomposition—is essential for the equilibrium and sustainability of a lake ecosystem. Hence, these ecosystem functions are basic for detecting lake health problems. 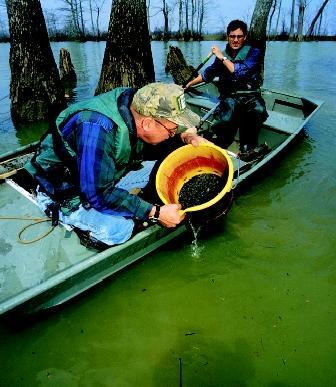 Two lake ecologists sample bottom sediments in Thighman Lake, Mississippi for small invertebrates, which are one indicator of ecosystem health. Imbalances in lower levels of the food web can affect the entire lake community. Nutrient cycling is the process that recycles, through decomposition, what has not been used or has been discarded by lake organisms. The bacterial community "cleans up" and provides essential nutrients (mainly phosphorus and nitrogen) for the phytoplankton. For this process, most bacteria require oxygen. Overproductive lakes will produce excess food that will eventually lead to high rates of decomposition with a consequent high use of oxygen. These conditions contribute to premature lake aging and the likely disappearance of species that are oxygen-sensitive and that require less eutrophic conditions. Ecosystem structure characteristics like biodiversity, abundance, and organism health provide another way to assess lake health. Biodiversity commonly refers to the number of different species present; abundance is how many of the same species are present. Various numerical indices, such as the Index of Biotic Integrity, are used to measure changes in biodiversity and abundance. Changes can include the disappearance of some species, often followed by a replacement by other species. This tradeoff can potentially bring high numbers of an "undesirable" species (e.g., rough fish); introduce odor-and taste-producing algal species (in terms of drinking water); increase or decrease production or decomposition; and change the balance of omnivores , insectivores (insect-eaters), and piscivores (fish-eaters) in the lake's food web . * The health of individual organisms also can affect ecosystem structure; for example, the presence of animal deformities (tumors, skeletal anomalies), or a disruption in endocrine function that in turn disrupts reproduction. Internal lake processes such as water circulation, residence time, temperature, and light play important roles in the way a lake reacts to environmental stressors. Important assessments evaluate whether the whole lake "turns over" (completely mixes) once or more during the year (water circulation); how long the lake water stays in the basin that contains it (residence time); the temperature range to which organisms are exposed; and how deeply sunlight penetrates into the water. The relations between the biological community's reactions and changes in these variables are more difficult to assess. External inputs to a lake will cause a complex series of biological and chemical reactions. In the case of nutrient input, it is important to assess their quantity and chemical form. Will organisms be able to use the nutrients? Will either the nutrient type or quantity cause conditions that will trigger premature lake aging? Input of water laden with sediment will cause decreased light penetration, and can carry nutrients as well as chemicals, some of which may be toxic . Rain amount and frequency will cause short-term changes in the water to which organisms must be adapted if they are to survive. The assessment of these types of inputs is a more common practice than assessing their effects on biological and chemical lake health. Scientifically based management helps preserve a lake ecosystem's stability and integrity. Questions a manager should answer include: For a given factor, what is the threshold level at which the lake's properties are compromised? Can it be returned to its previous healthy state? Management goals should consider economic and political needs and include a vision for the future. Management practices should be specifically developed for the lake's characteristics, human uses, and societal expectations. Societal values determine human perceptions of the "value" of a lake. The value concept will differ according to the region of the world and the economic status of its population. The degree to which aesthetics, recreation, public health, and economic development are entered in the formula to assure lake health will be determined by society's awareness that people are part of, and depend on, the lake ecosystem. SEE ALSO Biodiversity ; Ecology, Fresh-Water ; Fisheries, Fresh-Water ; Lake Management Issues ; Lakes: Biological Processes ; Lakes: Chemical Processes ; Lakes: Physical Processes ; Nutrients in Lakes and Streams ; Pollution Sources: Point and Nonpoint ; Stream Health, Assessing . Belsky, Martin H. "Implementing the Ecosystem Management Approach: Optimism or Fantasy?" Ecosystem Health 1, no. 4 (1995):214–221. Costanza Robert, Brian G. Norton, and Benjamin D. Haskel, eds. Ecosystem Health: New Goals for Environmental Management. Washington, D. C.: Island Press, 1992. Hellawell, J. M. Biological Indicators of Freshwater Pollution and Environmental Management. New York: Elsevier, 1986. Spellberg, Ian F. Monitoring Ecological Change. Cambridge, U.K.: Cambridge University Press, 1991. * See "Lake Management Issues" for a schematic of the lake eutrophication process. * See "Lakes: Biological Processes" for an illustration of a typical food web.